B. 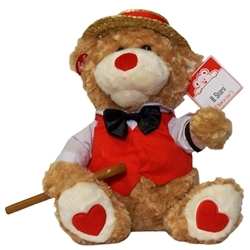 Sharp is an animated bear that sings and sways to "Book of love". B has the barbershop quartet look with an actual wicker woven hat, cane, and vest. B. Sharp is 12" tall.